This Father’s Day, celebrate the most important man in your life with this show-stopping steak dish that’s sure to be a hit! With Father’s Day just around the corner, are you still trying to figure out what to get that special guy? Instead of the typical gifts, this year why not get him something unique that he’ll really enjoy? I’m talking steak. Big, beefy, marbled, meaty goodness. 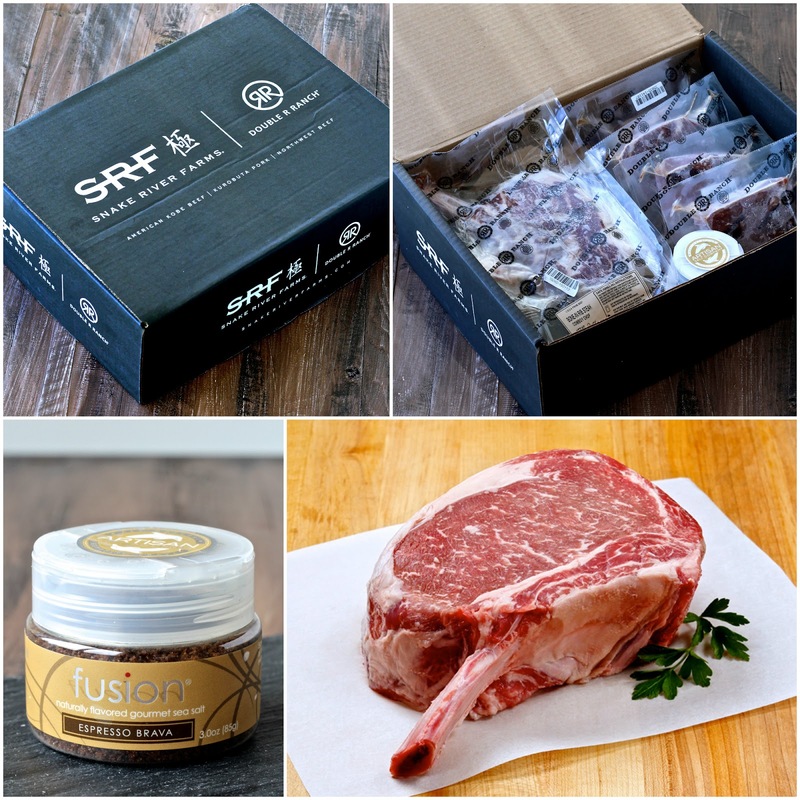 If he’s a steak lover, then Snake River Farms and Double R Ranch have the perfect Father’s Day gifts to please the most important man in your life. Growing up, celebrating special occasions meant getting together with family and sharing fabulous meals together. My dad is an amazing cook. When I was a child, my parents cooked together most nights and this definitely influenced me in terms of my love for cooking. But Father’s Day was one of the few days when my dad could put his feet up, relax and get pampered while the rest of us cooked a special meal just for him. This year, unfortunately I won’t be able to celebrate with my dad in person because of the distance but I will be celebrating with my husband Pete. It’s Pete’s third official Father’s Day as a dad and I want to make it special. With a very active toddler, it’s difficult to go out to fancy restaurants like we used to. So I’m going to prepare a fantastic, special meal at home to celebrate the most important man in my life (and the best daddy in the world!). to producing the highest quality beef and pork in the United States. Their products are served in some of the best restaurants in the world including The French Laundry, Per Se, CUT and Craft Steak to name a few. The folks at Snake River Farms and Double R Ranch sent over an incredible box of products for me to sample called the “Dad’s Perfect Gift” bundle. It arrived in a sleek black gift box promising delicious gourmet treats inside and it did not disappoint. I was immediately impressed by the quality of the steaks, all of which came individually wrapped. The steaks have a lovely color with beautiful marbling, which guarantees a deliciously tender product with rich, full-bodied flavor. I also loved the Espresso Brava sea salt. Coffee and steak make a delicious pairing- if you’ve never tried it, you must! This meal is all about my husband Pete- he loves a good steak every now and then. Beef is packed with protein and is a good source of several nutrients like iron, zinc and Vitamin B12. Plus there are actually 29 cuts of beef that are considered to be “lean.” In honor of Father’s Day, I decided to go for it and cook the Cowboy chop for him. 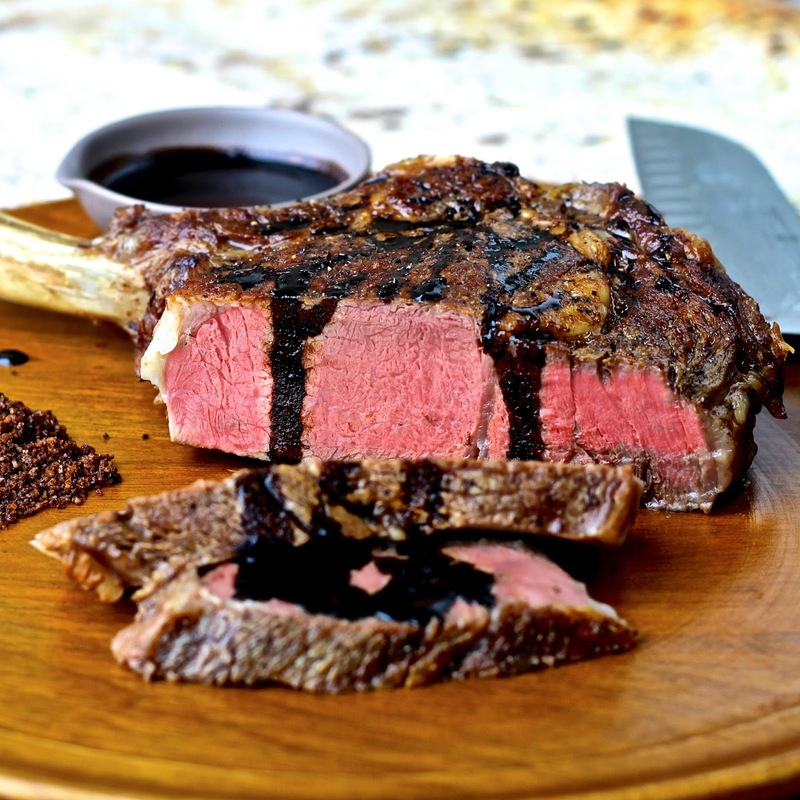 Sometimes referred to as a Tomahawk steak, this unique cut is actually a USDA Prime bone-in ribeye steak that’s large enough to feed 2 or 3. It’s definitely a showstopper- perfect for special occasions. When you’re cooking a product of such high quality, simple is usually best. You don’t need any marinades or very strong flavors here. I just seasoned the meat with a generous sprinkling of kosher salt, freshly ground black pepper and the Espresso Brava Sea Salt. That’s all you really need to bring out the natural, rich flavor of the steak. I decided to cook the steak my favorite way- by pan-roasting it in a cast iron skillet. Pan roasting is a great way to cook steak, especially thicker cuts. 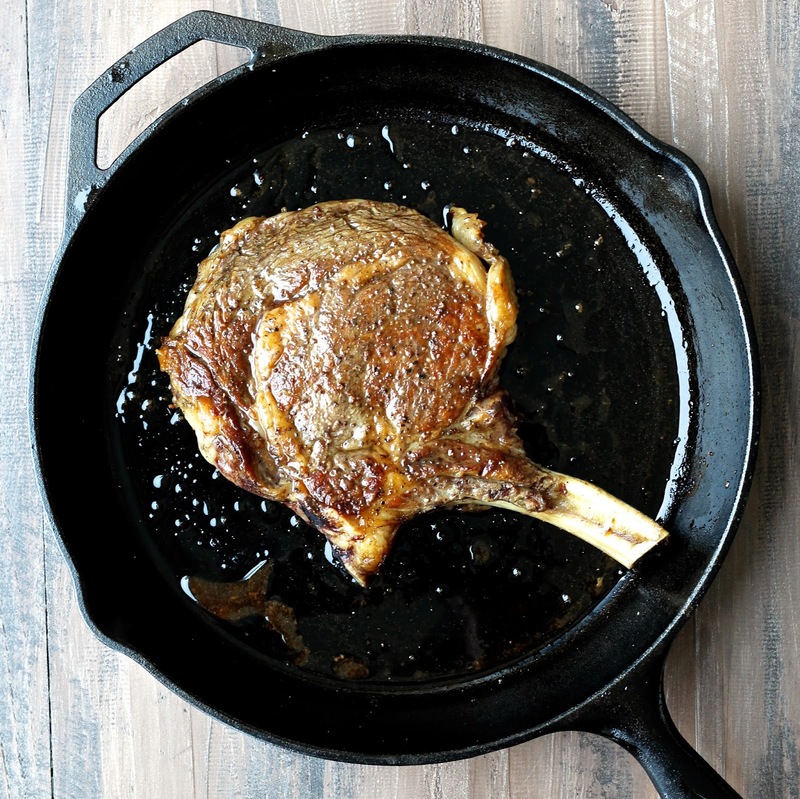 First you sear the steak in a hot skillet, which gives you a delicious brown crust. Then you transfer the skillet to the oven and cook until the desired doneness. Let it come to room temperature; never cook cold meat straight from fridge or it will cook unevenly. Season it with salt and pepper just before cooking. Get the pan and oil really hot to get a good sear on the steak. Don’t overcrowd the pan otherwise the steak will steam instead of brown. Be patient and don’t touch! Don’t move the steak once it hits the pan. You want a nice crust to form. After a few minutes, it will let you know if it’s ready to be flipped because it will release easily from the pan. Sear the second side and place the skillet in the oven to finish cooking. This ensures even cooking throughout. redistribute. If you don’t do this, all of the juicy goodness will run out onto your cutting board instead of staying in the meat. Finish with a sprinkling of a finishing salt for a flavor boost. If you follow these rules, you should get a perfectly cooked steak every time. To determine doneness, you can press on the meat with your finger but I suggest using a meat thermometer. It takes away all of the guesswork. I made a simple balsamic reduction to drizzle on top of the steak and also served oven-roasted sweet potato wedges and a delicious kale salad on the side. The steak was tender and juicy with a wonderfully rich flavor. It tasted like a steak you would get at a top-notch steakhouse. Although it didn’t need anything else, the sweet balsamic reduction nicely complemented the savory meat and smoky espresso sea salt. Pete absolutely loved the meal so I’m definitely going to be making it again on Father’s Day! This Father's Day, celebrate the most important man in your life with this show-stopping steak dish that's sure to be a hit! To make the balsamic reduction, place the vinegar, maple syrup, garlic and mustard in a small saucepan. Simmer, stirring occasionally, until thickened and syrupy, 10-12 minutes. Remove from heat. 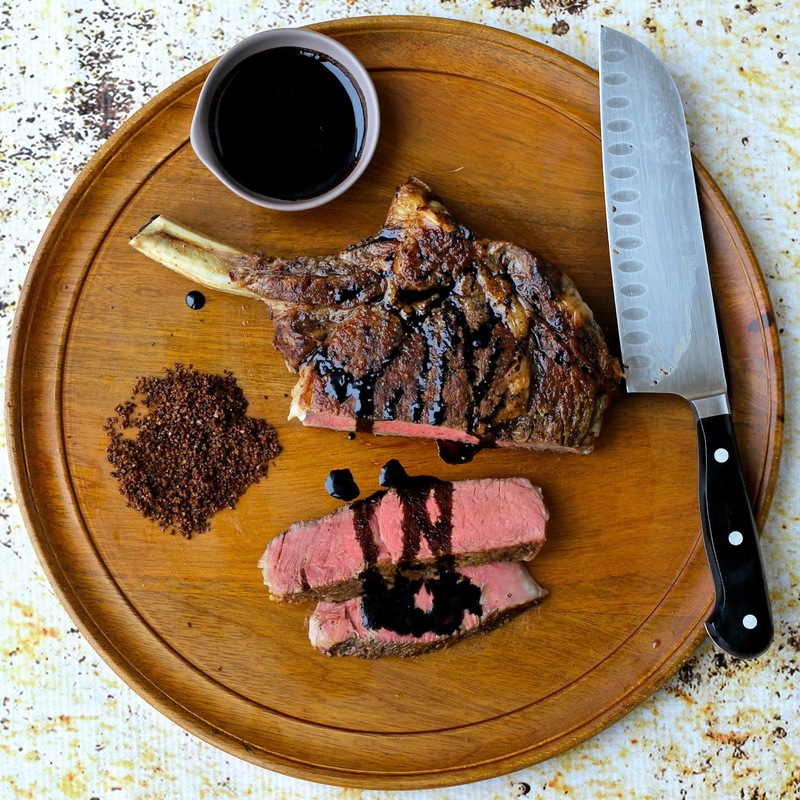 Sprinkle the top of the steak with a generous pinch of salt, pepper and Espresso Brava sea salt. Heat the oil in a large cast iron skillet over medium high heat on the stove. When the oil is hot, add the steak, seasoned side down. Season the second side with salt, pepper and espresso salt. Sear the steak without moving it until browned, about 4 minutes. Flip and cook another 2-3 minutes on the second side. Transfer the skillet to the oven. Cook to desired doneness, flipping the steak halfway through cooking. Let the steak rest for 7-10 minutes. Sprinkle a pinch of Espresso Brava sea salt on top, slice and serve with the balsamic reduction. loving the unique flavor combo here! yum! This steak looks mouthwatering Sonali! Love it ! Pinning to try it!